Lash extensions, latisse and fiber mascaras are all competing with each other. Everyone claims to be the best and most convenient way to get you bigger, thicker and longer lashes. I have fed into the hype. I have tried all there is to try. There are pros and cons with everything so its up to what you think is best for you. Here we go. "Lash growing" serums and potions are from low to high end. The only one that works is Latisse and yes it works. It gives you more lashes and longer lashes, but not thicker and if they don't curl now they wont with Latisse. You may have itchy eyes the entire time, I did. Cons: makes your eyes itch, not thicker lashes, makes your eye color darker (browner even if you have blue eyes), lashes fall out if you stop using it, its $100 a tiny bottle. 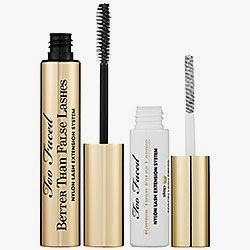 Fiber mascaras, whether its Too Faced Better Than False Lashes or Loreal Voluminous Fiber Mascara they flake off. Essentially, a sandwich of mascara lint and mascara. The lint eventually flakes off and not all of it so you have random black hairs on your face. It looks really nice for a few hours or in photos. It's just not an all day thing and only works for top lashes. Cons: flakes off, doesn't last all day, not sold separately so you will always have more of one than the other. Lash extensions (silk, mink, novalash) look amazing 24/7. They look real, full, fluffy and no need for mascara. I go back to them constantly because of convenience, honestly. It really does things mascara cannot do. The kardashian girl's don't have better eye makeup than everyone else, it's lash extensions. Glycol an ingredient in many face washes, makeup and makeup removers will easily start breaking down the glue. Cons: it's not cheap, you have to be careful how you sleep and wash your face, finding a good lash technician is trial and error. If you are in the area this is the girl to see 561-735-2794 at Atelier Boutique for amazing affordable lashes. Personally for me the extensions are the way to go aside from just regular mascara. I think that latisse would be perfect for someone with shortly curly lashes and fiber mascara if you lived in colder weather than I do! Hey, cupcakes! So I don't ever blow out my hair. Mostly because there is a lot of it and I'm lazy. Recently, the flu has been rampant where I live and even though I have the vaccine and am an avid handwasher I don't want to chance anything. So, I have been trying to keep my hair dry to not give myself a chill or anything like that. My hair is naturally straight and untreated but extremely long. This is what takes so long plus the feeling of something heavy and damp on you is just annoying. I have tried all the drug store products to "help cut down blow dry time". No. Awful, sticky, smells chemically or plain doesn't work. The only thing that works at my local CVS for this dilemma is a turbie towel. I know it sounds gimmicky but I swear this helps take a lot of the moisture out of my hair! "The original. Stays in place! Microfiber. Twist and loop. Less blow drying! Better than a bath towel! 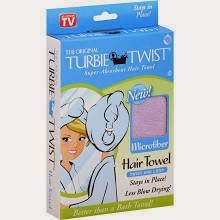 Turbie Twist is the original super absorbent hair towel. Its unique twist and loop systems makes it the hair towel that stays in place. The Turbie Twist features a tapered design which allows for a perfect fit for all head sizes. Made with 100% Microfiber, the Turbie Twist is functional, comfortable and lightweight! Features of the Turbie Twist: Super absorbent microfiber. One size fits all. Twist and loop system. Lightweight. Machine washable. Tapered design fits all head sizes. Elastic loop stays in place. Unique pocket holds extra long hair. Great for kids and adults! Easy as 1, 2, 3. Place. Twist. Loop." Yep, it's all true I hate to admit because infomercials annoy me to no end. This cut the drying time to 40 minutes. Better than 2 hours but still could be better. On to higher end products. I tried the 3 supposedly best known KMS free shape, Kenra Platinum blow dry mist, and Paul Mitchell Express Style quick slip. Okay, lets start with KMS Free Shape. Almost 7 oz for $17.00 and its a spray form. Pros: smell is good not chemically or anything. It's easy to use and it doesn't leave my hair feeling greasy or anything. It could have been worse, but for $17.00 I was hoping to have my socks rocked. Not so much. Onto, Kenra Platinum Blow Dry Mist which came highly recommended by the chicks at Ulta. It is 3.4oz for $22.00. Holy! This better be amazing. Pros: doesn't smell like anything, easy to use as a spray, dries my hair in 12 minutes!!! What!?! Cons: makes my hair feel so dirty and almost like its being coated by a film or something similar to product build up eww, expensive as hell, first time I ever saw my hair smoke...hmmm. It works, but it's expensive and it makes your hair feel gross so you in turn wash it more and need this more. Almost like rain-x in a bottle. It's repelling water off of you literally. Last, Paul Mitchell Express Style Quick Slip. It is 5.1 oz and $13.00 also got this at Ulta after returning the Kenra disaster. Cheaper, but not cheap. Pros: a little goes a long way (2 pumps for 3 ft of hair), dried my hair in 20 minutes, adds shine and is a heat protector. Cons: its a cream form so its up to you to evenly distribute it, it's faster but not crazy fast, smells a little like Elmer's glue. It was the best out of the three. Not because it was the best but because the pros and cons were the ones I could live with most. Honestly, the best investment in all of this was the $7 Turbie Towel from CVS! LOL! Who would've thought?